7buruk: Pishevari a Puppet or a Revolutionary !!!! Pishevari a Puppet or a Revolutionary !!!! Stalin’s Letter to Pishevari …. It seems to me that you misjudge the existing situation, inside Iran as well as in the international dimension. First, You wanted to meet all revolutionary demands of Azerbaijan right now. But the existing situation precludes realization of this program. Lenin used to put forth revolutionary demands as practical demands, as practical demands only when the country experienced a grave revolutionary crisis aggravated by the unsuccessful war with external enemy. Such was the case in 1905 during the unsuccessful war with Japan and in 1917 during the unsuccessful war with Germany. You here want to emulate Lenin. This is very good and laudable. However, the situation in Iran today is totally different. There is no profound revolutionary crisis in Iran. There are few workers in Iran and they are poorly organized. The Iranian peasantry still does not show any serious activism. Iran is not waging a war with external enemy that could weaken Iran’s revolutionary circles through a military failure. Consequently, there is no such situation in Iran that could support the tactics of Lenin in 1905 and 1917. Second, Certainly, you could have counted on a success in the cause of the struggle for the revolutionary demands of the Azerbaijani people had the Soviet troops continued to remain in Iran. But we could no longer keep them in Iran, mainly because the presence of Soviet troops in Iran undercut the foundation of our liberationist policies in Europe and Asia. The British and Americans said to us that if Soviet troops could stay in Iran, then why could not British troops stay in Egypt, Syria, Indonesia, Greece, and also the American troops - in China, Iceland, in Denmark. Therefore we decided to withdraw troops from Iran and China, in order to seize this tool from the hands of the British and Americans, to unleash the liberation movement in the colonies and thereby to render our liberationist policy more justified and efficient. You as a revolutionary will certainly understand that we could not have done otherwise. There is no profound revolutionary crisis in Iran. There is no state of war in Iran with external enemies, and, consequently, no military failures which could weaken the reaction and aggravate the crisis. So long as Soviet troops stayed in Iran, you had a chance to unfold the struggle in Azerbaijan and organize a broad democratic movement with far-reaching demands. But our troops had to leave and left Iran. What do have now in Iran? We have a conflict of the government of Qavam with the Anglophile circles in Iran who represent the most reactionary elements of Iran. As reactionary as Qavam used to be in the past, now he must, in the interests of self-defense and the defense of his government, carry out some democratic reforms and seek support among democratic elements in Iran. What must be our tactics under these conditions? I believe we should use this conflict to wrench concession from Qavam, to give him support, to isolate the Anglophiles, thus, and to create some basis for the further democratization of Iran. From this assumption stems all our advice to you. Of course, one could adopt a different tactic: to spit on everything, to break with Qavam and thereby ensure there a victory of the Anglophile reactionaries. Yet, this would not have been a tactic, but stupidity. This would have been in effect a betrayal of the cause of the Azerbaijani people and Iranian democracy. Forth, You, as I found out, say that we first raised you to the skies and then let you down into the precipice and disgraced you. If this is true, it surprises us. What has really happened? We used the technique here that every revolutionary knows. In the situation similar to the situation of Iran today, if one wants to achieve a certain minimum of demands pursued by the movement, to movement has to run ahead, to progress beyond the minimal demands and to create a threat for the government, to ensure a possibility of concessions on the part of the government. Had you not run far ahead, you would not have had a chance in the current situation in Iran to achieve these demands “ concessions” that the government of Qavam has to make now. Such is the law of revolutionary movement. There could not be even mention of any disgrace for you. It is very strange that you think that we could have let you down in disgrace. 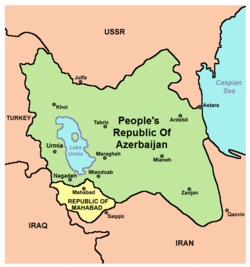 On the contrary, if you behave reasonably and seek with our moral support the demands that would legalize essentially the existing factual position of Azerbaijan, then you would be blessed both by the Azeris and by Iran as a pioneer of the progressive democratic movement in the Middle East.